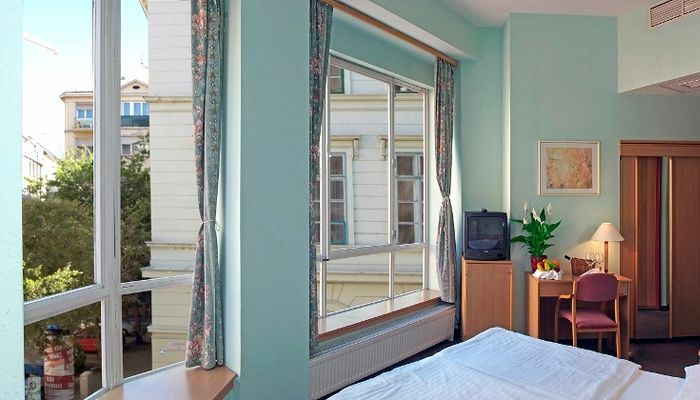 The City Hotel Pilvax is an elegant and yet homely hotel situated in the very heart of Budapest city centre. The hotel is located on a quiet side street just a few minutes' walk from the bustling pedestrian shopping street Váci utca and the Danube Promenade. Thanks to its central location the hotel is within easy reach of the majority of the city's most popular attractions (the Parliament, National Museum, Central Market and Buda Castle), can be accessed without any difficulty by walk or with the excellent public transport links. Ferenciek tere (Ferenciek Square) underground station (metro line 3) and bus stop is just 3 minutes walk from the hotel. Due to the hotel's location the rooms are calm, they offer a perfect place for recreation. It really is a perfect base for both business and leisure stays in Budapest. The hotel's building was erected in 1925 but the City Hotel Pilvax was opened only after a renovation in 1997. It was named after the famous Pilvax Coffeehouse which had been a popular meeting place of the 19th century young intellectuals and the starting point of the Hungarian revolution in 1848. The two-storey hotel, which is pervaded by historic atmosphere, offers 14 twin, 12 double, 4 triple and 2 single rooms.Please note that all rooms are Non-Smoking rooms. • Full board is available at 24 EUR per person. The tastefully furnished, bright non-smoking and spacious rooms are welcoming and friendly, featuring facilities like en-suite bathrooms, large, luminous spaces, colour TV set with satellite programmes, radio, telephone, refrigerator, work-desk and air-conditioning. Hair dryer is available on request in each room. The two-storey cosy hotel offers 12 non-smoking double rooms. The tastefully furnished, bright and spacious rooms are welcoming and friendly, featuring facilities like en-suite bathrooms, large, luminous spaces, colour TV set with satellite programmes, radio, telephone, refrigerator, work-desk and air-conditioning. Hair dryer is available on request in each room.